Liquids—> To help divert liquids from trash and recycling- Or put directly into compost. Recyclables—> Clean and free of food debris. Set up rinse station to aid in this process. A separate station can be set up if your event is collecting bottles and cans to return or for charity donation. Food Scraps—> Check with your hauler to know what is accepted based on the food scraps final destination. Landfill—> What remains and cannot be reused, recycled, or composted. CVSWMD has a variety of sorting stations options complete with signage, FREE for your one-time event. Consistency is key. It is important that every sorting station at your event looks the same to avoid confusion for your event guests. Same bins, same order at every location. 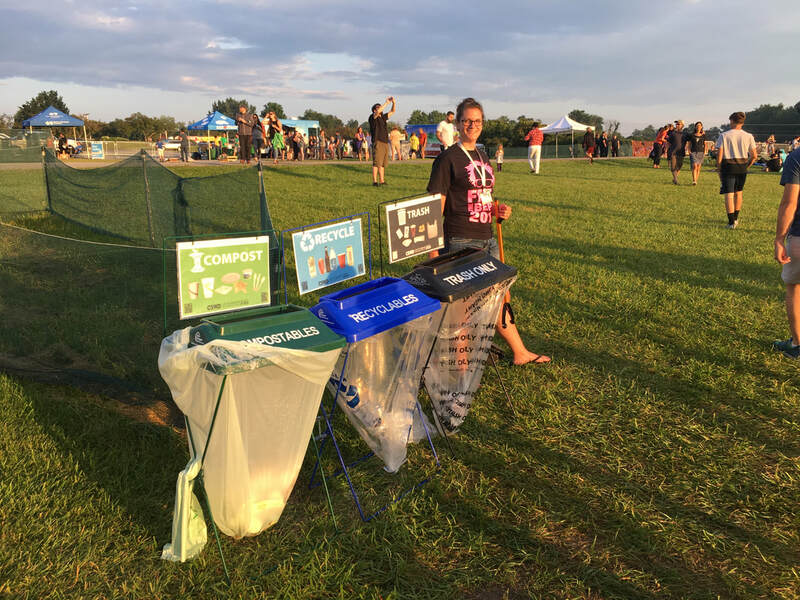 Use this simple formula for smaller events—> 1 Zero Waste Station/25 guests. For larger events contact your local hauler. Once you have determined the number of sorting stations, you will need to map out their locations within the venue. Sorting stations need to be set up in key locations throughout your event venue, such as by entrances, exits, and eating areas. This will help you later in determining the number of volunteers/staff you'll want to have. Where are the current landfill bins located? You might consider having a station wherever there are currently landfill bins. What is the layout of the venue? Consider placing sorting stations where food and beverages are being served and consumed, bathrooms, and along heavy traffic flows. Having a large event doesn't necessarily mean more stations, but it might mean more bins at EACH station. More stations = more bins for staff/volunteers to empty. Keep all your supplies stocked at one central location, or distribute enough at each sorting station. Clearly label your bin or bucket with contents and contact info if misplaced. Signs: Sorting signs at each station will help guest quickly and correctly sort their items. Photos and images: Use colors corresponding to bin color and images or photos of what you want to go in the bins. OR staple or tape ACTUAL containers to the sign. Reusable: Make them laminated or painted so you can reuse them at other events. Plain paper signs will get damaged or fall off when wet! Click on this link to download printable 11 x 17" signs! Click on this link to download printable 8.5 x 11" signs!